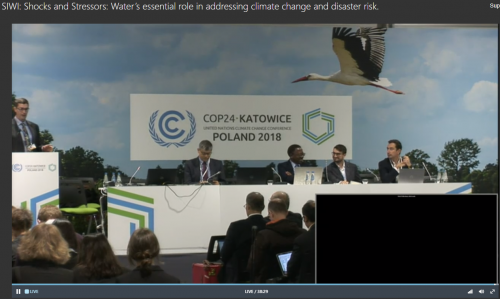 At COP24 today 5 December 2018, a panel session chaired by John Matthews of AGWA focused on ‘Shocks and stressors: water’s essential role in addressing climate change and disaster risk‘ as part of their ongoing campaign #climateiswater. Watch session stream here. Convened by AGWA, SIWI, SEI, World Water Council, The German Corporation for International Cooperation, and the UN High Level Expert Panel on Water and Disasters. AGWA and SIWI are both collaborators of the Resilience Shift and SIWI is specifically a grantee on our resilient water governance work). The Resilience Shift, along with SIWI and many other organisations from the global water sector, has presented a joint letter to the UN on building a resilient future through water, and has participated in selected UN High Level Panels on this subject at World Water Week and elsewhere this year. The session participants included Pasquale Capizzi from Arup’s International Development team which is working with the Resilience Shift in its work on resilient water governance and influencing the water sector. The Resilience Shift along with the City Water Resilience Framework will be presenting on Friday 7 December on its governance work and introducing the WaterShare tool. 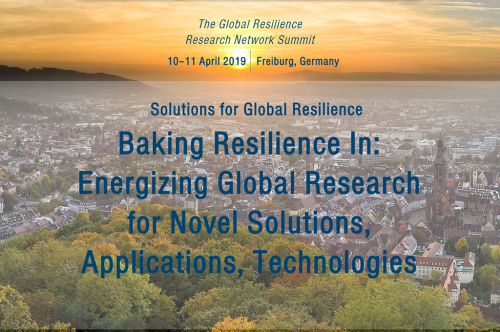 A journal is to be published in parallel at globalwaterforum.org on Mastering disaster in a changing climate: Reducing disaster risk through resilient water management. 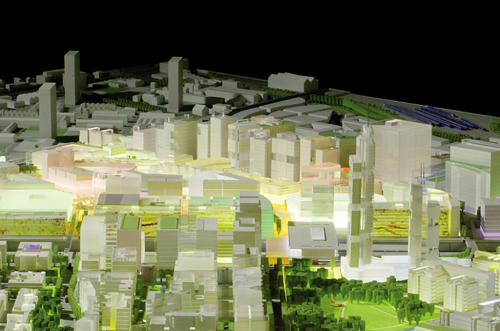 It is jointly authored by : AGWA’s John Matthews, Ingrid Timboe, Abou Amani, Anik Bhaduri, James Dalton, Kathleen Dominique, Arup’s Mark Fletcher, Danielle Gaillard-Picher, Torgny Holmgren, Xavier Leflaive, Kenneth McClune, Anil Mishra, Sonja Koeppel, Martin Kerres, Daniela Krahl, Robert Kranefeld, Tom Panella, Diego Rodriguez, Amit Singh, Susanna Tol, Maggie White, Cees van de Guchte, Frank van Weert, Niels Vlaanderen, Taeko Yokota.